The Starship Enterprise free-falls during a trailer for the new "Star Trek Into Darkness" science fiction movie. The Starship Enterprise has seen better days. In the newest trailer for the science fiction movie "Star Trek Into Darkness" — premiered during the Super Bowl last Sunday (Feb. 3) — what appears to be the Enterprise can be seen free-falling toward the surface of a planet while aflame and smoking, ultimately plunging into a body of water after hurtling through skyscrapers in a futuristic city. The mysterious villain of the new Trek film (played by Benedict Cumberbatch) is the most likely cause of the problems the Enterprise faces in the trailer, though director J.J. Abrams has kept mum on the details and motivations behind the latest adversary to threaten Enterprise Captain James T. Kirk and his crew. Not since the 1984 film "Star Trek III: The Search for Spock" has a Kirk-led USS Enterprise seen such hard times. 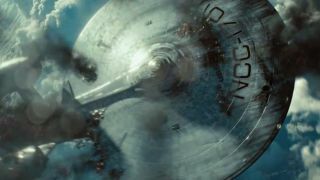 In that film, Kirk and his crew decide to destroy the Enterprise using its auto-destruct program to prevent it from falling into Klingon hands. The starship explodes in space and then crashes down onto the planet Genesis, where the Kirk and his crew beam to safety. "My God, Bones, what have I done," an exasperated Kirk, portrayed by iconic actor William Shatner, then says. A later incarnation of the Enterprise, The NCC 1701-D led by Captain Jean-Luc Picard, was destroyed in the film "Star Trek: Generations" when it crashed after a battle with a Klingon Bird of Prey. The newest Star Trek incarnation is set for release on May 17, but fans of the movies can use the newly released "Star Trek Into Darkness" app to play games and unlock content related to the film. The app is available for free through iTunes and Google Play.